Hotel guests: adults & supervised minors welcome daily, 8 a.m. 'til 11 p.m.
General public over age 18 welcome daily, 10 a.m. 'til 8 p.m.
General public supervised minors welcome daily, 11 a.m. 'til 6 p.m.
10 p.m. 'til 11 p.m. is "Quiet Hour"
Our hotel soaking pools are filled with chlorinated saltwater – it is more buoyant and relaxing! The Soaking Pool will be closed the first and third Tuesday of every month for maintenance. Wednesday, March 20th the saoking pool will be closed for repairs from 8 am - 3 pm. 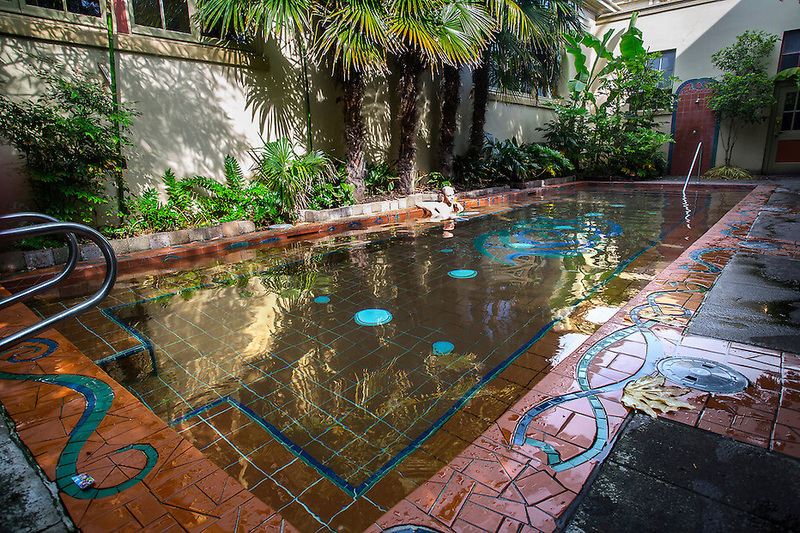 A ceramic work of art, this heated pool is located in a private outdoor courtyard surrounded by gardens (formerly where the old Teacher's Lounge was located). Hotel guests have complimentary use of the pool as part of their overnight package. The general public is invited to enjoy the soaking pool for $5 per person, per hour, any day. 18 & over (with photo ID) are welcome between 10 a.m. and 8 p.m.
Minors with parent or guardian are welcome between 11 a.m. and 6 p.m.
Free Neighborhood Soakers – Please be aware that the only form of proof we accept for a free soak is a valid Oregon State ID with your current address. This address must be within the boundaries of Northeast 22nd Avenue, Northeast 42nd Avenue, Northeast Columbia Boulevard, and Northeast Prescott Street; excluding the small area starting on the south side of NE Alberta Ct. and to the east of NE 33rd Ave. The address must be on your photo ID or it will cost you 5 dollars to get into the pool. Items left behind in the soaking pool will be kept for 30 days before being donated. It is important to know that chlorine is present in our soaking pools. 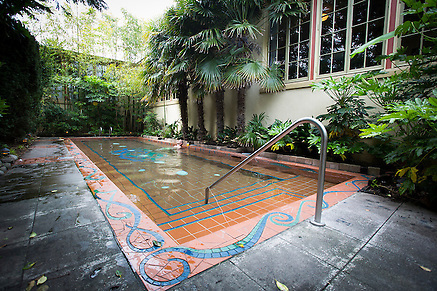 All of our pools (Edgefield, Kennedy School, Old St. Francis School, Grand Lodge, Crystal Hotel) utilize salt cells that convert low levels of salt (sodium chloride) to chlorine. This means that a saltwater pool is not actually chlorine-free – it simply utilizes a chlorine generator instead of a direct addition of chlorine. To meet health department requirements, we also add granulated chlorine to break down and release contaminants from the pool. Many people previously convinced that they had an allergic or other aversion to chlorine found no such problems after experiencing a salt-based system. A salt system allows us to more precisely control the sanitizer output, often requiring lower levels to achieve water purity. The mineral salts have many health benefits of their own. Additional chemicals that we use to maintain proper chemical balance for bathers include: sodium bicarbonate, soda ash, calcium chloride, sodium bisulfate, muriatic acid, and monopersulfate (commonly referred to as MPS).